Summer is an opportunity for educators to recharge both their mental and emotional energy and their enthusiasm for their profession. Indulge in a few hours in the sun, a dip or two in the pool, and an icy beverage. Then consider how you can use what is left of summer to prime you for the rebirth that next school year offers. Here are my 5 approaches to summer professional growth. Educators should read books that were written for educators, but should also read books that were not written with education in mind specifically. Education books, whether they are written by researchers or practitioners, can have a direct impact on day-to-day practice and can provide the inspiration you might need to inject the next school year with some new energy. Books that were written to inspire entrepreneurs or innovators can also apply to classrooms and schools. How can teachers and administrators think creatively about budgets, schedules, and spaces to bring more to their learners every day? What about novels that our students can read and that inspire all of us to examine other perspectives? My school has provided a few options for the summer community read and all of them ask students to honor differences, consider the bravery that is required of leaders, and think of how to spread goodness in our world. Want to know more about the titles I'm reading this summer? Click here to see the full list. What are you planning to read this summer? How are you hoping it will influence your classroom and your work as an educator? Ken Robinson, whose TED Talk is the most popular of all time, created his own list of 10 talks on education. Some of my favorites are on the list and I'm planning to make time to watch the ones I haven't yet viewed. The 20 most popular TED Talks of all time also includes Susan Cain's talk on introverts and Simon Sinek's talk on leadership. Both talks have definitely influenced the way I work in my classroom and with my colleagues. I'm looking forward to watching the talks on the list that I haven't seen yet. This playlist is full of talks from inspiring teachers. Topics range from best ways to teach maths and sciences to keeping the Taliban from shutting down a school. Of course I'd be remiss if I didn't recommend my own talk. As an advocate for the power of technology in education, I encourage to watch and ask yourself, "What if?" In person connections are a powerful force for learning. When I attend conferences (or unconferences) I'm there for the keynotes, workshops, sessions, and hands-on opportunities. But mostly I'm there for the face-to-face connections I can make, the conversations we can have, and the stories we can share to both empathize and inspire one another. Make time for education events that are structured and formal like conferences. Look for the organizations that focus on your content area, on technology, on leadership, or on any other focus you have in your own professional growth. When you are there, be sure to make the keynote and featured speakers' talks. Look at the schedule ahead of time and pick your sessions to personalize your conference experience. Take notes using Evernote or Google Docs so you can refer back to them and share them with your colleagues later. Remember to make time, also, for events that are more participant driven, less scheduled, and way more affordable. Edcamps, which are FREE, and CUE Rock Star Camps, perhaps the best bargain in education, are my favorites. In both cases, the rule of two feet applies. Since there is no formal conference etiquette, participants are free to contribute to sessions, ask questions, or even leave for another offering if a particular session isn't meeting their needs. I love the culture of empowerment and choice that comes with that kind of learning environment. Each of the events I'm attending this summer will provide me with an opportunity to connect with a slightly different population in education. Want to know where to find me? Click here to see the list. What professional learning events are going planning to participate in? Who are you hoping to learn from while you're there? If you want to continue the conversations you started at events or reach out to the authors of the books you've read, look no further than social media. Look them up and give them a shout out. Don't be surprised when nearly everyone responds and engages with you. Still haven't taken the dive into Twitter chats? Now is the time. Summer nights are relaxed, your mind is open, and your kitchen table isn't covered with lesson plans and tests to correct. Open your laptop and give Twitter chats a try. First, download TweetDeck to help you manage the chat hashtag better. Then, read 140 Twitter Tips for Educators to get yourself familiar with the etiquette and best practices. Take a look at this website with Education Chats organized on a calendar that is easy to reference anytime you are looking for inspiration for fabulous colleagues all over the globe. If you are intimidated and don't want to dive in, watch a chat or two first. Then go ahead and introduce yourself. You'll be hooked to the energy and the learning soon enough. Twitter is perhaps the most common medium educators use to connect, but it is far from the only social media platform. I also recommend Voxer for more personal discussions, Facebook for groups of educators, and Periscope for a live peek into the day-to-day of your teacher friends from far away. You can find more details on all of these tools and how you can use them in the Educator's Guide to Social Media from ConnectSafely. The best part of my summer learning plan is that, in many cases, I'm reading or attending with colleagues from my school. We have already scheduled debriefs meet ups, both virtual and in person, throughout July and August. We are also working toward planning our own school-wide mini-conference just before school starts so we can share our learning with others. We want to have a solid plan for how we will use all of this inspiration for the benefit of our school and our students. Once you have mapped out your own professional learning, be sure to set aside time to figure out how you will apply what you've learned to your classroom, school or district. Of course, between chapters, TED Talks, conferences, and Twitter chats be sure to take a nap or a sip of a cold glass of lemonade now and then. 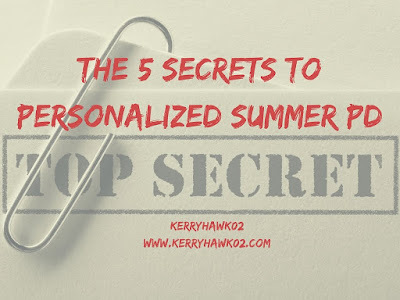 Summer is for reigniting your teacher passion and recharging your teacher batteries. With some planning, you can do both.